The WVM models the average irradiance over a PV plant footprint. It does this by smoothing the measurements from an irradiance points sensor by different amounts at different timescales. The WVM smoothed irradiance can be used with irradiance to power translation methods to create simulated PV plant power output. To run the WVM, you need measurements from an irradiance point sensor, some information about the PV plant you’d like to simulate (see code syntax section and examples section below), and the cloud speed. See reference  for more details. Note: you’ll need the PV_Lib toolbox installed on your computer to run the WVM. If you don’t already have it, get the PV_Lib toolbox here. computes the spatially-smoothed irradiance using the wavelet variability model. smooth_irradiance is the WVM smoothed irradiance representing the average irradiance over the plant footprint. It maintains the time stamps of the input irradiance (irr_sensor.time). 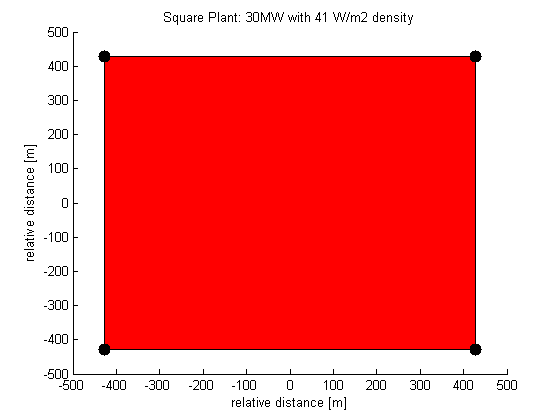 WVM example with a square plant. This is the easiest method and requires only the plant MW rating and the PV density. A PV density of 41 W/m2 corresponds to 1MW per 6 acres, which is a common rule of thumb for PV plants. Specify polygon vertices to define plant outline. 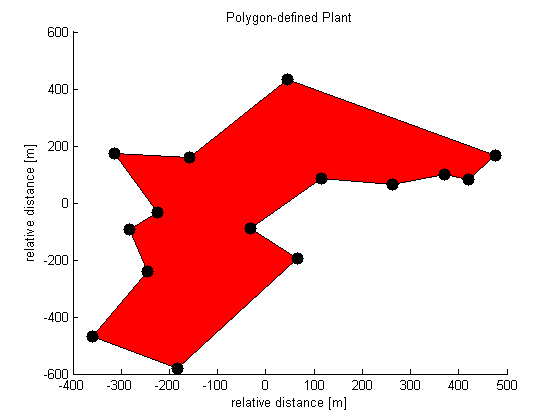 WVM example with a polygon plant. This setting allows you to simulate a PV plant that is not a square-shape by providing the latitude and longitude of the polygon vertices corresponding to the plant footprint. 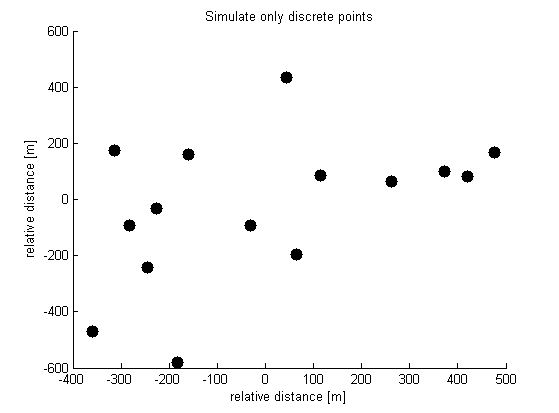 Simulate the aggregate output at defined discrete points. WVM example with discrete inputs. This setting simulates the average irradiance measured using a network of irradiance point sensors. The WVM output on this setting will not be the average irradiance over the whole footprint, but rather the average of only the discrete locations of the point sensors. The user provides the latitude and longitude of the points to simulate. Derive cloud speeds from numerical weather forecasts, as described in reference . Use a ground network of irradiance sensors, e.g., as described in reference . See the supporting program pvl_WVM_compute_CS_from_sensor_network that can be used to compute the cloud speed if you have an irradiance sensor network. Make an educated guess. Based on  and other work, coastal areas such as Hawaii, Puerto Rico, and San Diego typically have slow cloud speeds (e.g., 3-7 m/s), probably due to the typically low-level clouds. Inland areas such as Las Vegas and Albuquerque typically have fast clouds speeds (e.g., 10-30 m/s), likely due to the typically high-level clouds. Power = Irradiance/(1000 W/m2) * Rated Capacity * DCtoAC Derate. Complicated models accounting for temperature, module and inverter technology, etc. Some such models are already included in the PV_Lib toolbox, such as pvl_sapm and pvl_snlinverter. 2. Lave, M.; Kleissl, J; “Cloud speed impact on solar variability scaling – Application to the wavelet variability model”, Solar Energy, Volume 91, May 2013, Pages 11-21, ISSN 0038-092X, http://dx.doi.org/10.1016/j.solener.2013.01.023. 3. J.L. Bosch, Y. Zheng, J. Kleissl, Deriving cloud velocity from an array of solar radiation measurements, Solar Energy, Volume 87, January 2013, Pages 196-203, ISSN 0038-092X, http://dx.doi.org/10.1016/j.solener.2012.10.020. Neither the name The Regents of the University of California, the names of its campuses nor any abbreviation thereof, nor the names of the contributors may be used to endorse or promote products derived from this software without specific prior written permission.